Though small in scope logistically, this successful UN operation in the Spring of 1951 had major significance both strategically and tactically. 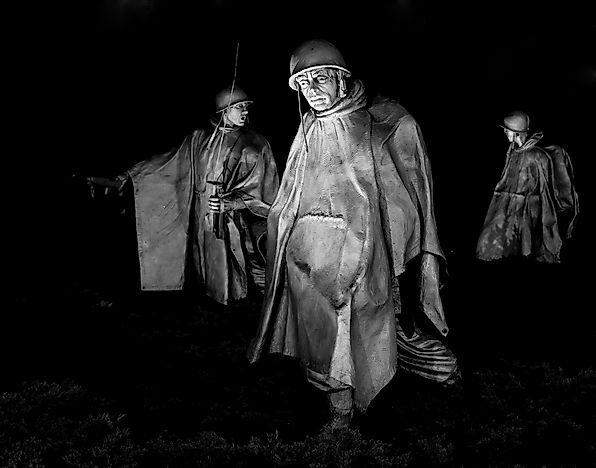 Operation Courageous was a military operation carried by the United States military with South Korean support between the 23rd and 28th of March, 1951. This military operation during the Korean War pitted the United States and the Republic of South Korea against the Communist sates of China and North Korea on the land area between Imjin River and Han River. Under the leadership of General Matthew Ridgway, the plan was to trap a large number of the Communist troops between the Han and Imjin Rivers. The operation was an important adjunct to the recapture of Seoul by the United Nations (UN) Allied Forces in Operation Ripper. Fighting for the UN’s objectives against the Communists was the “I Corps”, led by U.S. Army General Matthew Ridgway. The I Corps was comprised by the United States 3rd and 25th Infantry Divisions, and the South Korean 1st Infantry Division. They faced Chinese and North Korean units, many from the 19th Division of the North Korean Army, holding positions between the Han and Imjin Rivers along the Aspen, Benton, and Cairo Lines. They planned to secure the area and link up with Ranger Special Forces and U.S. and British tank units. The major objective of Ridgway’s men in the operation was to advance on the Chinese and North Korean troops, and strive to secure desired positions on the Imjin River as quickly as possible. On 21st March 1951 General Ridgway ordered I Corps to make a move to line Cairo in an attempt to prevent and attack the North Korean I Corps. Operation Courageous also comprised of another plan (Operation Tomahawk), and the intent of this other mini-plan was to drop 187th Airborne Regimental Combat Team at about 30 kilometers north of the larger operation’s front lines. For this to be carried out, General Ridgway had to be assured that weather conditions on the 23rd of March were favorable. This plan was executed by about 3,500 paratroopers, parachuting from flying C-199 aircraft. After the successful landing of the 187th RCT, they then linked up with the armored elements of the United States' 3rd and 24th Infantry Divisions. The Chinese casualties, as counted on the field, included 136 dead, while the numbers that were taken captive were 149. On the United States and South Korean side, the casualty figures were relatively lighter, and totaled 19. Further interrogation of the Chinese and North Korean captives revealed that the Communist troops who had been in the operation area were from the 36th Regiment of the 19th Division of the North Korean Army, and were estimated to be between 300 and 500 in number. The majority of the remainder of the North Korean I corps had initially withdrawn from this strip of the Imjin’s banks, before the American airborne landing had begun. Operation Courageous saw a victory for the combined American and South Korean troops over their Communist adversaries. The American-led forces were positioned well from the start of the operation, as they had the advantage in regards to military arms at their disposal, a higher troop count, and better coordination in terms of logistics employed during the entire operation. In contrast, the Communists had become overextended subsequent to their New Year’s Offensive. The biggest danger in the resistance met by the American and South Korean forces were landmines, which ultimately did little damage to the tanks they used. For instance, on the 23rd of March, the Task Force led by Colonel Growdon passed the Republic of Korea and met no opposition from the Communist Chinese forces. The only notable incidence was when the third tank from the task force passed a destroyed bridge at Changnung River and hit a land-mine. A team of military engineers worked on and removed many of the other mines from the route, and Colonel Growdon’s force moved about a mile before encountering more serious land mines at Sinwon-ni. The Chinese and the North Koreans were forced to withdraw from the operation zone, and this kind of retreat allowed the Americans and South Koreans to further pursue the Communist forces.